Nov. 7: (I missed yesterday) I am thankful that when Miss Add told me that she had 2 Gilberts that she was just make believin’ and hadn’t really found Mommy out…or was she just trying to tell me that she is cool with the idea??? Nov. 8: I am thankful for date nights. 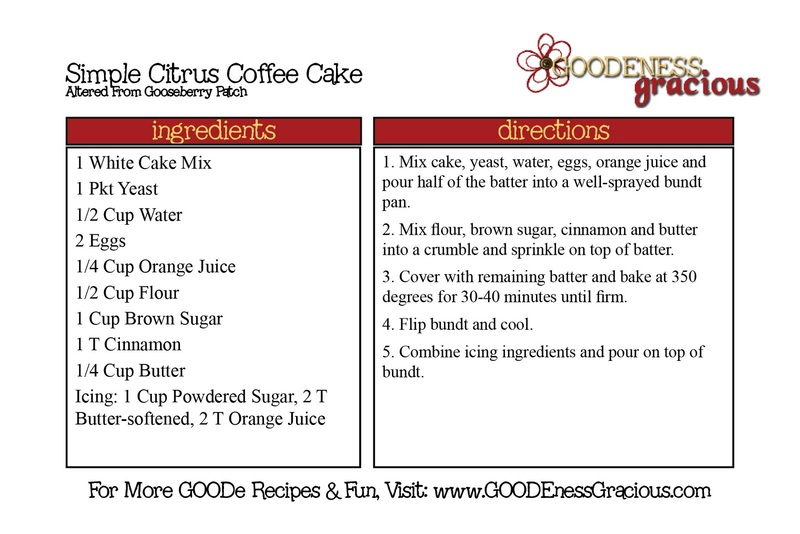 Today’s Goode & Gooseberry Patch Project Recipe is Simple Citrus Coffee Cake. Because I just love gadgets, I picked up this super cool whisk-sh scraper thingie and just had to use it. Whisk, mix, scrape. Whisk, mix, scrape. Whisk, mix, scrape. And 1/4 Cup of Softened… err Melted Butter and mix’er up real GOODe. Then sprinkle on top (and forget to take a picture) and then add the second half of your batter. Then I realized I didn’t have any of said flowers… so I improvised… I just cut ‘er up before the meeting. That reminds me, I really should rent that movie sometime soon… I totally heart it! Try "My Life in Ruins" with the same actress whose name I will NOT attempt to spell! It's great and so was your cake! Thanks for sharing it with us! Yes, every single time I hear the word 'bundt,' I think of that movie!! LOL I'm looking forward to making this recipe for two main reasons: 1. I LOVE citrus and 2. I like baking things in my bundt pan! Thanks.